E is for Explore! : S.T.E.M. PBS Kids Design Squad Nation - teacher resources for S.T.E.M. activities. The site includes electricity, force / energy, simple machines, and many more categories that can tie into your Project Based Learning lesson plans. 3. The Math Lab explored gravity by creating a bungee cord for Barbie dolls to go on a thrilling adventure! This is a great activity for students to use their measuring skills. Through trial and error, they determine the best length for the cord (made of rubberbands). 4. Mrs. Davis, from Birmingham k12, had her class build "Out of this World Vehicles!" Students pretended that they were engineers and designed / constructed a lunar vehicle that could carry lunar rocks (wooden blocks) for a specific distance and timeframe. Check out the lesson plan here! 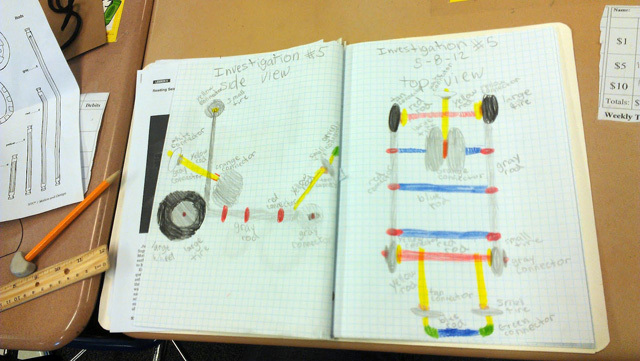 Also, take a look at Mrs. Bushnell's 4th Grade's design / motion challenge (featured below) and Drew's Animals' rover!